Lawrence Crocker and Sylvanie Williams — the two Uptown elementary schools in the New Orleans College Prep charter network — will add tuition-based seats to their preschool programs in the fall, part of a broader long-term strategy to create a completely new early-learning center in New Orleans. The New Orleans College Prep network already offers 160 preschool seats for 4-year-olds at Crocker, Sylvanie Williams and its new preschool expansion campus at the site of the former Hoffman elementary school. Those seats are funded by a state program called LA4, which provides schools with money for a set number of preschool seats to be awarded to students from low-income families. Under College Prep’s new plan, Crocker and Sylvanie Williams will each add 20 more pre-K4 seats, but these will require a tuition payment of $5,250 from the families. A similar structure — adding tuition-based seats alongside the low-income LA4 seats — is already in place at a number of other charter schools around the city, such as Lycee Francais, Morris Jeff, Homer Plessy, Encore Academy and Audubon Charter, said Ben Kleban, founder of the New Orleans College Prep network. The value of early-childhood education is well established, and expanding access to it at the College Prep schools is one goal, Kleban said. Newer research, meanwhile — touted by new U.S. Secretary of Education John King — shows that socioeconomic diversity in schools confers its own benefits to students, he said, and the tuition-based preschool will help build that in New Orleans College Prep. “Children from all backgrounds do better in more diverse environments,” Kleban said at Tuesday afternoon’s meeting of the College Prep governing board. In fact, the fact that the state limits the LA4 program to low-income students, but does not fund any other form of public preschool, has the unintended consequence of concentrating poverty in those classes, “establishing a feeder pattern to kindergarten with little racial or economic diversity,” Kleban wrote in a memo the the New Orleans College Prep board. “We see the opportunity to blend tuition-based seats in our pre-K classrooms as an opportunity to begin to interrupt the segregation that has plagued our city’s schools system for generations,” Kleban’s memo reads. The school has already begun a marketing effort around the new program, and Kleban said they are particularly aiming at the children of teachers, both at their schools and others around the city. Teachers’ families will recognize the significant value of a preschool education, but they also fall in the income range most likely to be attracted to the program — too high to qualify for LA4 seats, but significantly burdened by school programs that easily cost twice as much elsewhere. The preschool, Kleban said, may form a first step in a much larger project to create a new early-childhood education center for children ages 0-4 that would be 50 percent low-income, and 50-percent tuition based. School officials are looking for a site in the Warehouse District, to serve the thousands of workers for whom no nearby childcare is available, but he said that project is still in the exploratory phase and no site has been selected. Tuesday’s meeting also included an update from Kleban on the progress SB 432, the state law that would reunite all New Orleans schools under the Orleans Parish School Board by 2018. After it passed the Senate unanimously, it was expected to be heard Wednesday in the House education committee. Kleban has praised the process leading to the creation of SB 432 by Sen. Karen Carter Peterson, saying that both the charter school leaders and the OPSB and RSD superintendents were heavily involved in crafting the process by which schools would return. While SB 432 faces some competition from a bill by state Rep. Joe Bouie — which mandates that the schools be returned by 2018 without offering as much details on the process — Kleban said most of the educators in the city support Peterson’s version. The progress of the bill represents a real possibility that the RSD will come to an end soon, returning all schools — including New Orleans College Prep — to the oversight of the OPSB. Tuesday’s meeting took place at Walter L. Cohen College Prep High School, and much of the meeting focused on its progress. Cohen — ranked as one of the worst performing schools in the city just a few years ago — dramatically pushed its School Performance Score to a B last year. That increase was based partly on rising test scores and partly on the four-year graduation rates at the school, which takes into account not only current students, but also both students who attended Cohen in the past and tranferred to other schools, and those who have transferred into Cohen partway through their high-school careers. Thus, the fluctuation in that graduation rate can be difficult to control, and it is expected to fall this year — in short, Cohen’s B may drop to a high C this year. “There is a risk that we won’t cross the B threshold this year, but it will be pretty close,” Kleban said. At the other schools, benchmark testing suggests that Crocker will improve the C it earned last year, said Chief Schools Officer Andy Parker. Sylvanie Williams fell to a D last year — which must be raised back to a C in two years for College Prep to retain its charter — and Parker said benchmark testing shows that the school is likely to get close to that goal this year. “If it’s not a C, it’s going to be on the high end,” Parker said. Enrollment has begun at the schools, and 1,341 students have been matched to College Prep schools in the first round of the OneApp. They have almost met the 1,385 student they budgeted for already, but hope to reach 1,563 by October 1, after future rounds play out, Kaharick said. 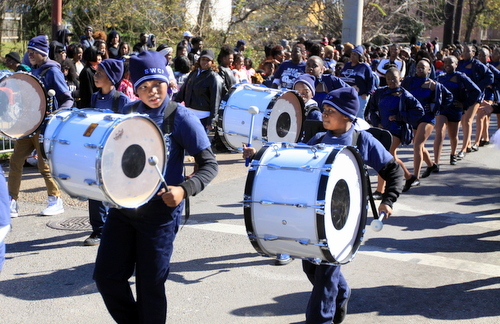 Cohen had an unexpected shortfall in its incoming ninth grade class last year, so the school has launched an aggressive marketing campaign around its high performance score, its 100-percent college acceptance rate and its extracurricular activities, particularly its marching band. The Spears Group consulting firm has created a commercial for the school focused on a Cohen College Prep student now attending Morehouse, and the spot will debut during the next episode of ‘Empire,’ an extremely popular show among high school students. School officials are excited for students’ reaction after the ad premieres, and played it for the board Tuesday night. See below for live coverage from Tuesday’s meeting.